My wife called her the Eiffel Tower. It was a way she could remember her name but also because she seemed to stand tall among the people who broadcast the news. 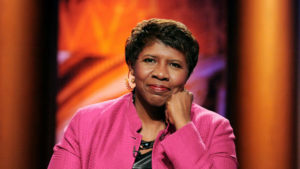 Nothing could stand in her way of watching Gwen on Washington Week in Review on Friday nights. We watched her and her teammate Judy Woodruff almost every night on their news hour show on PBS. It was a comfort to watch these two professional work together in presenting the news. They made a remarkable team. When I heard that she has passed on I was surprised because I did not know she was sick and it seemed like yesterday that I had last seen her on television. I immediately thought it may have been in shock over experiencing the election victory of Donald Trump. But then I remembered on the election evening broadcast that she was not there with Judy. For some reason I did not think that was strange even though she had been there on prior occasions analyzing the performances of the actors during the debate. Gwen was calming and knowledgeable and trustworthy. She presented the news in a straight forward manner never intruding her political preferences into it. Although it is obvious that PBS is woefully liberal, you never got that feeling from Gwen. Perhaps because she was ill some of its offerings lately have been less than interesting. Like all other networks the news on PBS seems to be slipping into the realm of entertainment rather than news. For a commercial free network it seems that too is getting like an NFL television broadcast with the five or so minutes of subtle commercials between shows. I never blamed Gwen for that. I never blamed her for anything because I enjoyed her broadcasts so much. There have been many passing of newscasters over my lifetime but I do not recall feeling as sad as I did when I first heard the news of Gwen. May she rest in peace after a job well done. Great journalist and news reporter. Washington Week was enjoyable to watch, she never talked over her guests and always had a steady calm about her. I did not know she was sick and was stunned to find out she passed. I felt the same way – that I had just seen her reporting the news and she never looked ill. True that. She was an outstanding journalist. I thought she was as good as any and better than most. I can’t think of too many other newscasters that I would call ‘rock solid’. She certainly was.